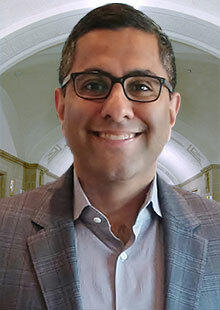 Aaron Dhir is a Florence Rogatz Visiting Professor of Law and Oscar M. Ruebhausen Distinguished Senior Fellow at Yale Law School, as well as an Associate Professor, with tenure, at Osgoode Hall Law School. His scholarly interests center on corporate law, governance, theory, and accountability. Aaron Dhir is a Florence Rogatz Visiting Professor of Law and Oscar M. Ruebhausen Distinguished Senior Fellow at Yale Law School, as well as an Associate Professor, with tenure, at Osgoode Hall Law School. His scholarly interests center on corporate law, governance, theory, and accountability. He was the 2017 Justin D’Atri Visiting Professor of Law, Business, and Society at Columbia Law School and the 2013–2014 Canadian Bicentennial Visiting Professor of Law at Yale Law School. He has also served as a Visiting Professor at Stanford Law School and as a Visiting Scholar at Harvard University, the University of Oxford, Berkeley Law School, and University College London. Professor Dhir is the author of Challenging Boardroom Homogeneity: Corporate Law, Governance, and Diversity (Cambridge University Press, 2015; paperback edition, 2016) and has published widely in scholarly journals. He has contributed opinion pieces to The Atlantic, Slate, The Globe & Mail, and The Toronto Star, and his research findings have been covered by The New York Times, The Washington Post, The Wall Street Journal, The Harvard Business Review, Forbes, Newsweek, The Globe & Mail, The Financial Post, The Toronto Star, National Public Radio, CBC Radio-Canada, The Seattle Times, The Hartford Courant, El Mercurio (Chile), and ThinkProgress. Professor Dhir is a recipient of the Osgoode Hall Legal & Literary Society’s Excellence in Teaching Award, the Osgoode Hall Faculty Teaching Award, and the South Asian Bar Association of Toronto’s Young Lawyer of the Year Award. He was recognized by Lexpert Magazine in 2011 as one of Canada’s leading lawyers under 40. He completed his graduate studies at NYU School of Law, where he was awarded the Arthur T. Vanderbilt Medal.